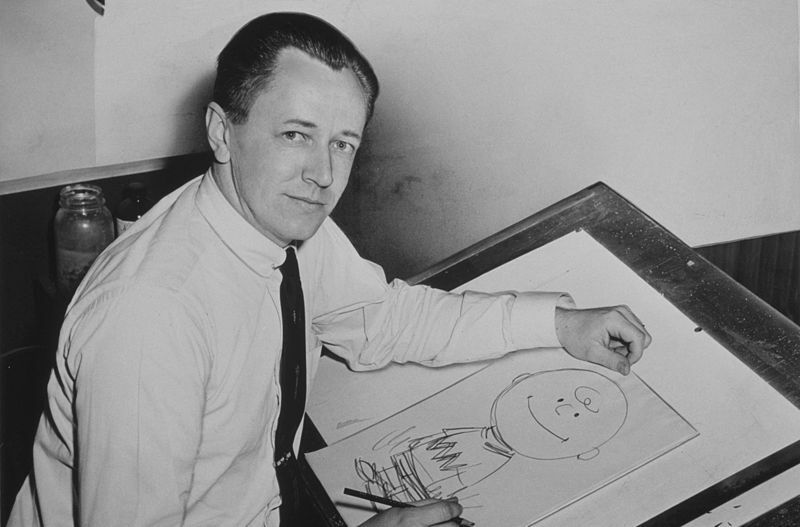 Charles Schulz’s life-long relationship with comic strips began within days of his birth on November 26, 1922 in Minneapolis, Minnesota. His uncle nicknamed him “Sparky” after the horse, Spark Plug, from the Barney Google strip when he was two days old, and it stuck for the rest of his life. That was one the few shining moments of Schulz’s academic career. He flunked most of his classes, and the cartoons he submitted for inclusion in the yearbook were rejected. The one bright spot was “Ripley’s Believe It or Not!” accepting one of his drawings when he was 15, which gave him the incentive to enroll in a correspondence course from Art Instruction Inc. after he graduated from high school. Then, in 1943, two events occurred within days of each other that would shape Schulz’s life forever; his mother died of cancer at age 50, and he left to fight in World War II. He became a staff sergeant in the 20th Armored Division and was always proud of his army service, but he was haunted by the dual shock of the loss of his mother and the grim realities of war. After his stint in the service, hid did various scut-type cartooning jobs including lettering and marketing. In addition, he taught at Art Instruction Inc. where he fell head-over-heels for a beautiful red-haired girl named Donna Johnson. He proposed to her, but she turned him down for another man. Charles Schulz never forgot her, and the little red-haired girl that Charlie Brown always longs for but never attains figures largely in “Peanuts”. After a three-year run of publishing his strip, then called “Lil’ Folks,” in the St. Paul Pioneer Press, Schulz’s first “Peanuts” (he always hated the name) strip appeared on October 2, 1950 in seven national newspapers. By 1956, it was published in over 100 papers, and the success of “Peanuts” and its cast of lovable and worldly-wise kids only continued to grow. Schultz described “Peanuts” as a primer on disappointment. After all, as he said, “All the loves in the strip are unrequited; all the baseball games are lost; all the test scores are D-minuses; the Great Pumpkin never comes; and the football is always pulled away.” Even still, Charlie Brown and all the other characters show an admirable amount of fortitude and resilience when faced with yet another stumbling block, which always made fans come back for more. After all, how many comic strips can you say are truly inspirational? After discovering that he had colon cancer in November 1999, Schulz announced in December that he would be retiring in early 2000. He died on February 12, 2000, the day before his final “Peanuts” strip ran.